What should be considered when replacing valves? Only identical valves may be replaced. At some points, valves are screwed directly into a block using screw connections. All fittings are used with a sealing adhesive (Loctite) on the factory side. When removing screwed connections, these must be completely removed and the adhesive residues carefully removed. Only then can the screwed joint be reused with new adhesive. A calibration of the analog measuring channels is not necessary after replacing valves! What should be done when replacing the LC display? Due to technical changes and technical progress, various LC display variants have been used over the course of time. Please first check which variant is installed in your device. What should be considered when replacing pressure regulators? Generally, the setpoint and the actual value in the PMF01 must be readjusted after replacing a pressure regulator. For this you need a pressure calibrator with the corresponding measuring range. What should be observed when replacing relative pressure sensors? In general, the analogue measurement channel must be re-calibrated. For this you need a pressure calibrator with the corresponding measuring range. What should be observed when changing flow sensors? In general, the analogue measurement channel must be re-calibrated. 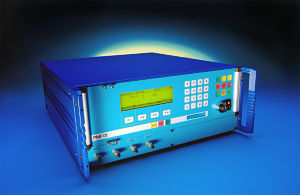 For this purpose, you need a leakage calibrator with the corresponding measuring range.